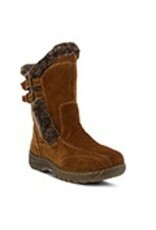 Water resistant, suede cold weather pull-on boot styled with faux fur trim and adjustable buckled straps. Heel Height (approximately): 1 1/2" Shaft Height (approximately): 7" Circumference (approximately): 12" Features: -Round toe, high quality suede, shiny metal buckles, lug sole. -Inside zipper closure. -Faux fur lining. 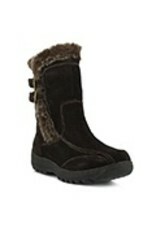 -Faux fur comfort padded insole. -TPR outsole.